I write this sitting at my son’s soccer practice. I figured I would utilise this time to do something productive because lately, I seem to have no time to devote to my site. I am very sad that my schedule has been, so brutally, upset. I enjoy my site and I enjoy the ‘me’ time I devote to it. It’s the only ‘me’ time I get and I treasure it. I love planning the recipes I will share, I enjoy (sometimes) setting up the paraphernalia to photograph the end product and I enjoy writing. However, what I thoroughly enjoy is what my blogosphere friends have been up to and the comments they share. It never ceases to amaze me that some of my blog friends, friends I have never met, take the time to write such thoughtful comments and share such great insights. I know they read so many blogs but to take the time and personalise each comment; I admire that greatly. So, to think that I may miss out on my weekly conversation with them is saddening. Life is so busy that a comment from a friend is sometimes all the conversation I can have during the day or even the week. So, my blog is important to me, and the fact that I can’t seem to dedicate time to it, is now frustrating and infuriating me! Today however, before life got really hectic, I took some time to accept a lunch invitation and chill for a bit. I almost didn’t because of the impending doom of unfinished chores and errands but I decided that this was way more important, especially for my sanity! I dropped all my children to school, told my uni student she needed to figure out her own way to the college (she rode her bike!! ), headed off to find a coffee roaster that I discovered online that was on the way to my friend’s house. Since I was a bit early, and I hadn’t had my coffee this morning (hubby’s on a work trip so I did the morning school run too), I searched for a proper coffee shop and not the usual green siren that tempts the poor, uninitiated, frou frou coffee drinker with her mediocre brew and exorbitant prices. What a find this place turned out to be! I am ecstatic because it’s so close to me and they roast their own coffee from small Fair Trade farms and they have a retail shop to sit and enjoy. I am hoping to go back and try more of their coffee and maybe write a piece on them. They were so nice and the guy behind the counter was thrilled to tell me about the farms and their suppliers. Coffee people, we’re so nice and friendly and readily available to impart our knowledge of coffee beans! I ordered a large cappuccino, that came complete with coffee art, and a pound bag of some Guatemala coffee beans. Can’t wait to dig into that bag. So, if anyone is around the Denver area, specifically Lafayette, check out Proper Grounds Coffee Roasters. So, today’s recipe has been in the works for weeks. I’ve gone through multiple batches of fresh, Western Slope peaches but all the ideas just never materialised. There was fresh peach ice cream, a no show, a peach crostata, never made it, a peach crumble, peach flaugnarde….and so on. Finally, enough was enough, I set out some time and made these Peach and Blueberry Crisps; nothing new or fancy, but they are gluten free and delicious, and they use beautiful, Colorado fresh peaches. I am using coconut flour to replace regular flour but not everyone, unless you’re on a Paleo Diet, will have coconut flour. This can be Paleo if you replace the raw sugar with raw coconut sugar. To make these gluten free without coconut flour, just substitute a GF flour or a gluten version with regular flour. A gluten free crisp made with fresh Colorado peaches, juicy blueberries, coconut flour and almonds. Toss the almond flour/ground almonds, coconut flour and the Turbinado sugar together. Add the butter cubes and blend in roughly into thick streusel like crumbs. Add the slivered almonds and mix. Toss the peaches with the sugar, cinnamon and add the vanilla. Divide between 6 ramekins and add blueberries to each. Cover each ramekin with the streusel mix. Bake at 325℉/160℃ for 30/40 minutes until brown on top and juices are bubbling. Serve with a dollop of cream or a scoop of ice cream. Regular flour can be substituted for the coconut flour, just increase the oven temperature to 350℉/180℃. Coconut flour and the almond flour tend to brown quickly so I use a lower temperature. A dollop of whipped cream or a scoop of vanilla ice cream is the only other thing you need, and maybe a spoon. I made the time to bake these but I wasn’t afforded any time to photograph them properly, so please excuse the mediocre photos. Lots of negotiations being made in the Coffee and Crumpets kitchen lately! Hi Nazneen, I recently came across your blog and love it! Thanks a lot for your recommendation for Proper Grounds – I went there earlier this week and was in coffee heaven. I would never have guessed such a gem was smack in the middle of my commute. Hi Fatima! Thanks for letting me know! I am so glad you found the coffee shop, it’s great isn’t it? Thanks Kiran, blogging is great when you have time and patient kids! This is my first time here and I had to comment on this post!! I love the combination of peaches and blueberries which I only discovered this summer. Love this post very much. Blogging takes a lot of time especially when you have such a busy life. I struggle with finding time myself to fit it all in. I hope you will be more lenient on yourself and know that when you have the time, this space will always be your space. I’ll definitely be a comeback follower. Love your blog! Thank you Zainab! Thanks for visiting, and for your kind words! I appreciate, and look forward to seeing you again. Yes, we do! I guess they think its easy and that’s why we see so many start up, but then they realise ow much work it is! Blogging becomes difficult at times when you work. But as you say this is the only space to call mine & now become a part of me. Take it with your own pace. Btw, peach & blueberry crisp looks delicious. Huma recently posted..Zunka Bhakar/ Besan/ Thalipeet. Thanks Huma and thanks for stopping by! Hi Nazneen! Oh this will be my favorite crisp using my favorite fruits blueberries and peach! It’s actually amazing how much “me time” goes into blogging, and still not having enough. I gave up on my TV time already but I didn’t mind at all. 🙂 So happy to hear all the food bloggers are going through similar experiences. Thanks Nami! I know, I’ve given up a lot of my TV time too, but I record my shows and catch them while I’m eating lunch or something. But sitting down and watching a show, it’s impossible lately. If it wasn’t for my IPad, I couldn’t read other blogs on the go or even type up my own! Thank goodness for technology!! I find it impossible to read and comment on the iPhone! I’ve done it but with difficulty, so if you find huge typos in my comments, I was reading it in my iPhone! Life does make blogging very challenging. For me right now it’s the total upset of my schedule that’s got me reeling. Blogging is hard to fit in, isn’t it? Especially when one works and has kids on top of it! I can relate. I think you have a lot going on so give yourself a break! The blueberry crisp looks delicious. I say that to myself all the time, just give it a break, but like I said, it’s my “me time”! I like to ccok and bake for it and photograph it, it’s all part of the therapy! And cheaper than a therapist!! Life has a way of messing up our plans, doesn’t it? When all else fails, I just schedule stuff – once I’ve written down that I’m going to do something at a certain time, I’m actually pretty good at keeping to it (and refusing conflicting demands on my time). Anyway, lovely crisp. We still are getting so many great peaches, and haven’t made a crisp in ages. We should try this – it looks wonderful. Thanks. You are way more organised than me John! I know I really should have posts ready to go and scheduled, but I don’t. I have recipes down and photos taken but they are not compiled into a post. I am a terrible procrastinator which is amazing because I am so organised otherwise! You spoke my mind, Nazneen. Blogging is the only me time I have but the summer was so hectic that I hardly had any. Hope you find a way to integrate the much needed “me” time in back to your schedule. The crisp has fantastic pairs of fruits and looks delicious. Thanks Lail! Hope things have settled down for you. Thats what I love too, the interaction with other people who you really start to see as your friends even if you have never met them. That’s why I couldnt stay away. Lovely dessert. I cannot wait for peach season – I adore peaches and nectarines (and blueberries for that matter). The difficulty for me is finding the strength to restrain myself from devouring them fresh so that they last long enough to cook with! Sounds like you had a fabulous find with your coffee shop! My mornings are usually spent in a line at http://lonsdalestreetroasters.com/ waiting for my morning coffee (if I haven’t made it myself, from beans purchased from said coffee shop). They do all their own roasting on site too, and the coffee is always brilliant! Your photographs are beautiful, even if they were taken in a hurry – we are always our own worst critics!! That’s been our problem, we keep eating all the peaches before I can even come up with a plan! They are so good when ripe and at their peak. Does Australia grow peaches or are they imported for you? Yes, my coffe shop is a keeper! We have many roasters here but their not so close to me to be local. This one is fairly close, not down the road though, but not too bad. Most importantly, the coffee was great! We grow them 🙂 There’s not much in the way of fruit that we don’t grow here, but some of the more exotic tropical fruits (like sapote and soursop) don’t transport well so we can’t get them all over the country, just up north! Ooooh, you guys get sapote? I love those. We can’t find them here easily, sometimes the Asian store will have them or the Hispanic store. I haven’t had one in ages. It’s nice to know Australia is self sufficient. You guys are truly local then. Thanks for the sweet words Minnie! How much do we moms relate to what you wrote, a lot. We all need some sane time, I’m glad you did my dear. It’s so nice that you’ve given so many options for the crisp, looks heavenly. Ghosh, I am so scared, I would eat all the topping and pass the fruits to the kids:) and oh, the pictures look delicious. Your comment made me chuckle Asha, I am so guilty of doing that too! But they’re old enough to know better now! I usually just double the topping! I, too, had Big Plans for peach season, Nazneen, and none were realized. Last year I made a peach & cherry cobbler and, at the time, I thought I’d experiment this year using blueberries instead of the cherries. Lo and behold! You’ve done the experimentation for me. Now, I’ll just follow your lead and I’ll be rewarded with an incredible dessert. Thank you for sharing and I hope that once your kids get settled into their school routines, you’ll have a little bit more “me” time. Thanks John! It really bugs me when I can’t do what I have planned to do. I feel frustration and just loss of control and if I don’t have that, I feel unbalanced and uncertain, and grumpy! Nazneen, I felt like you are speaking my mind. If I had known how much time and energy goes in food blogging I am not sure if I would have started one. But as you said this is the only ‘me’ time you get and like you I too enjoy this time and blogs at my own pace. The crisp looks great! Peaches and blueberries are the best together and the topping.. wow… I have to try with coconut flour. It’s great that you still find time to cook and blog. I also feel that way at times when life seems to be attacking me so I know how you feel. Hang in there and hugs to you. 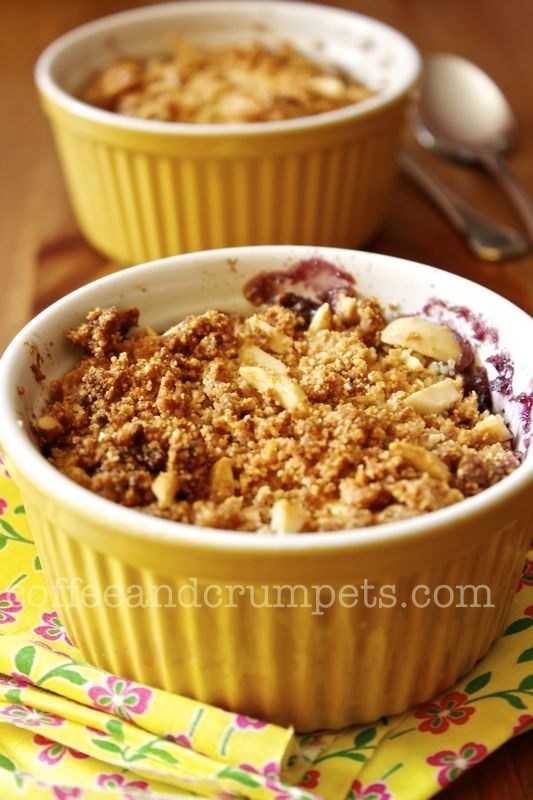 I love this Peach and Blueberry Crisp and I also love Guatemala coffee! Thanks Peachy! Isn’t Guatemala coffee great? It’s funny how it becomes a part of us so quickly! Do you mean the peach flaugnarde? It’s a clafoutis but only cherry clafoutis can be called a clafoutis, everything else is a flaugnarde! Those look delicious. I love your pictures. They look so artistic! Thank you Kat! You made my day with your sweet comment! I think that your pics are great, Nazneen! And the fruit crisp is simple yet fantastic. I’d be very happy to sit with you and eat more than one of these crisps — with or without a cup of coffee. Denise Browning@From Brazil To You recently posted..Eggless Avocado Mousse (Mousse de Abacate)…An ASAP favorite! Thanks Sonali! I am glad I am not alone in this. Does your brother live close to Layayette? It might be a drive for him if he’s in Denver. I know there are some great roasters in Denver.